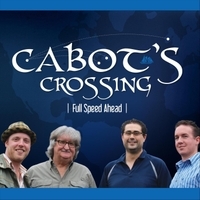 Cabot's Crossing has a repertoire firmly embedded in East Coast / Maritime / Newfoundland / traditional Irish music, from the Rankins and Great Big Sea to Ryan's Fancy and Stan Rogers, Christy Moore and the Pogues to John Allan Cameron and Ron Hynes. Born in Irishtown, Newfoundland, Dominic was weaned on traditional Newfoundland, Celtic and East Coast music sitting around the kitchen table with his father, two brothers and a multitude of uncles, cousins and friends who shared a love of the party. A classically trained singer (his voice is the only instrument he contends he’s any good with), Dominic sang in music festivals around Western Newfoundland until the time he was 15. After experimenting with hard rock bands across Canada, Dominic decided to return to his roots when he moved to Calgary in 2008. He landed a gig as a solo act at “The James Joyce,” where he met what would become his new bandmates from “Fiddler’s Green.” They would then go on to form “The Codfathers of Sole” and now “Cabots Crossing.” Dominic’s influences include Ron Hynes, The Masterless Men, The Irish Descendants, Ryan’s Fancy, Stan Rogers and The Rankin Family, just to name a few of the giants of east coast music. One of Dominic’s greatest thrills was hosting a song writers circle in Antigonish, Nova Scotia that included the likes of Hynes and Bruce Guthro. Born and raised in Bray, County Wicklow, Ireland, Bryan started his music career at a very early age. Influenced deeply by a close circle of musical friends that included the legendary Rory Gallagher and the Dubliners, his early band endeavours included concert billing with bands such as Skid Row and Thin Lizzie. After emigrating to Canada, Bryan decided to explore his roots in Traditional Celtic music and he focused his attention on developing skills in that direction. Bands such as the successful "Stephens Green" Band (recommended to Canada's Penguin Eggs magazine as one of the three top new music discoveries of 2005), "The Jigs Up!" and "Fiddlers Green" (still one of Western Canada's most popular Celtic Bands ) followed, performing from Ontario to British Columbia, at venues that included the Calgary Folk Festival, among many others. Fiddlers Green has been, and still is, a regular performer for the Calgary Stampede. In recognition of many of his ancestors' migration to the East Coast from Ireland during the Great Famine, Bryan's latest venture is into the Canadian/Celtic music scene with the co-development of Cabot's Crossing, whose members include some of Canada's best East and West Coast performers. From Calgary, Jonathan began playing violin at the early age of 4. Classically trained, his migration towards Celtic music began a few years later. Since then he has traveled and entertained audiences globally with organizations such as the Calgary Fiddlers and the Calgary Youth Orchestra and has shared the stage with country music stars Patricia Conroy, Paul Brandt, and the Charlie Daniels Band. Jonathan has participated in music festivals in Canada, England, Scotland, the Czech Republic and New Zealand to name a few. As a young performer, the Calgary Exhibition & Stampede Promotion Committee also relied heavily on him for more than 10 years to promote the world-famous Calgary Stampede to international visitors. Earning his Grade 8 Royal Conservatory in violin with honors, Jonathan taught violin privately for 5 years. Among Jonathan’s achievements is the 1996 album “Imprint” that he recorded as a member of the Fiddlers. In recent years, Jonathan has been an active member of “Fiddler’s Green”, “The Codfathers of Sole”, the “Jig’s Up”, and most recently “Cabot's Crossing”. Experienced in front of audiences large and small, Jonathan’s passion for music is why he continues to entertain audiences by the thousands. Robbie is a fiddler and pianist from Cape Breton, Nova Scotia. He is no stranger to the Celtic music scene, having performed on stage since five years of age. Mostly self-taught, Robbie picks up tunes almost exclusively by ear. He has been featured in the small community dance halls and large outdoor stages of all the major venues throughout Cape Breton, including the Broad Cove Scottish Concert, Granville Green Concert Series, Celtic Colours International Festival, and most recently, Kitchenfest. Robbie is known for playing pure traditional music mainly by Cape Breton composers and from the older collections of Scotland. He credits Buddy MacMaster and Willie Kennedy for having the most influence on his style and repertoire as a fiddler. Robbie is equally adept on the piano and it is this instrument that he plays primarily with Cabot's Crossing. His piano accompaniment is noted for its driving rhythm, walking bass lines and right-hand percussiveness. He travels home to Cape Breton during the summer and can regularly be found accompanying fiddlers Ian MacDougall, Howie MacDonald, as well as the late Marc Boudreau. Along with three of his own albums (joined by his brother Isaac on piano), he has recorded with Celtic superstars Ashley MacIsaac and Colin Grant.